Welcome to the 2016 edition of the circle meeting! 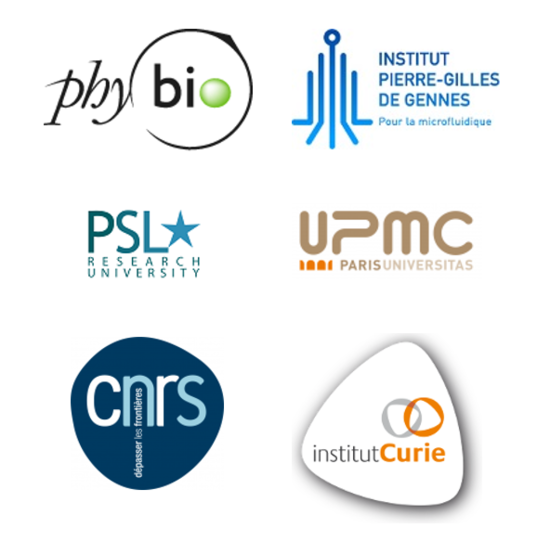 The meeting is going to take place in the center of Paris, at the new institute IPGG, on Monday 9th and Tuesday 10th of May. This year we are welcoming London as a new node. A keynote lecture will be given by Jean-François Joanny on active matter. First, please get in contact with your local node representative to be selected for either an oral presentation or a talk. Once your participation is validated, you can use the form below to register. The registration deadline is April 8th. Payment has to be done by credit card only. The meeting starts on Monday May 9th at 9am and ends on Tuesday May 10th at 4pm. We expect participant to come on Sunday afternoon and leave on Tuesday afternoon. A welcome drink will be proposed on Sunday evening (place tba). You can dowload the program here (previsional), and here is the map to find the meeting. All lectures, poster session, lunches and breaks will be held in the IPGG congress room. The buffet on Monday evenening will be held at "Chez Marie", a room located in the Curie Institute (2 min walk from the IPGG). All participants will be accommodated at the Hotel Magendie, 2/4 rue Magendie 75013 Paris, for two nights, on May 8th and 9th. Breakfast are included. Rooms will be shared between 2 or 3 participants (if you already know your roommates you can specify it during the registration process). The IPGG is at ~10 min walking distance form the hotel. You can find the iteneray here, passing by the well known and highly popular "rue Mouffetard".